Television presenter Noel Edmonds has been criticised by a road safety group after saying he had driven at speeds of more than 180mph. 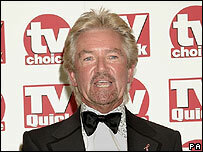 Edmonds, who hosts Deal or No Deal, told men's magazine Loaded he almost crashed while out on a high-speed spin. RoadPeace, a charity which supports crash victims and their families, branded the admission "appalling". Edmonds's spokesman said the incident happened 30 years ago and the star now regarded it as a "moment of madness". He is quoted as saying his Ford GT40 "needed exercise" and then almost lost control at a roundabout on the Tring bypass in Hertfordshire. Rita Taylor, a trustee of RoadPeace, said: "What would have happened if there had been something on the road? He wouldn't have stood an earthly chance." She added: "It's an appalling thing for a public figure to stand up and admit." Edmonds' spokesman added: "He was not boasting. He was answering a straight question and it is not something he would dream of doing now." Is 2006 the new 1976?